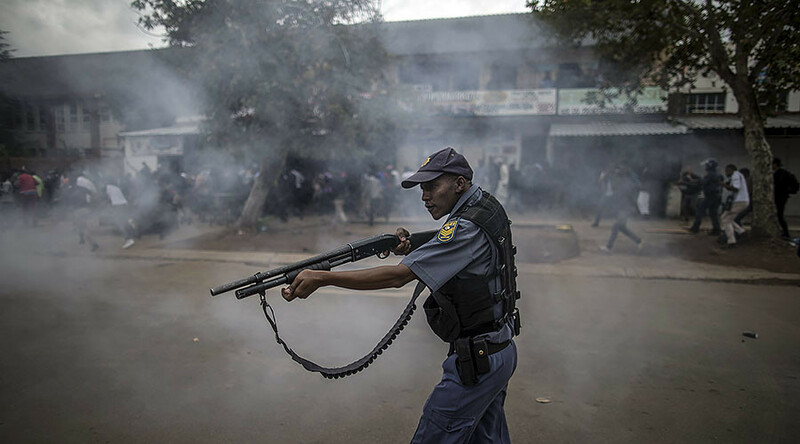 Police used rubber bullets and tear gas to disperse anti-immigrant protests in Pretoria, South Africa, after street clashes broke out among opposing groups armed with sticks, knives, and other weapons. Residents of the township of Atteridgeville were blocked from going to work after protesters threw rocks and burned tires, News24 reported. Police spokesperson Superintendent Isaac Mahamba said they had received reports of several shops being looted, but had yet to confirm the incidents. #TshwaneUnrest A small group is retaliating, they don't want to go back home. They want foreign nationals to know who's country they're in. News footage for the scene shows police firing rubber bullets at large groups of protesters while other videos show gangs of people roaming the streets armed with sticks, bottles, bricks, and knives. President Jacob Zuma called for calm ahead of the anti-immigrant march. He condemned the violence and called upon citizens and non-nationals to exercise restraint, unite against crime, and work with the authorities to prevent crime. Protesters later complained that the media depicted the demonstration as xenophobic when it was actually anti-crime. One demonstrator told journalist Mpho Raborife it’s unfair that foreigners come to South Africa for work when there is such a high level of unemployment in the country. South Africa’s unemployment rate currently stands at 26.5 percent. Last week, homes in Pretoria West were raided by South Africans who alleged they were being used for drug dealing and prostitution. Two houses were set on fire. Earlier this month, at least 10 houses in Johannesburg were set on fire for allegedly being used as brothels and drug dens.